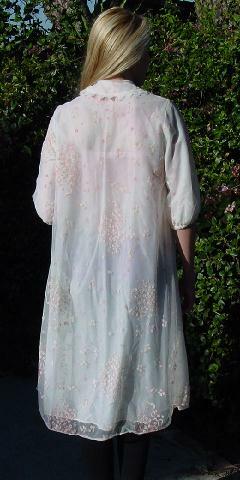 This vintage long sheer peignoir/robe has a sheer white outer layer over a semi-sheer white lining. 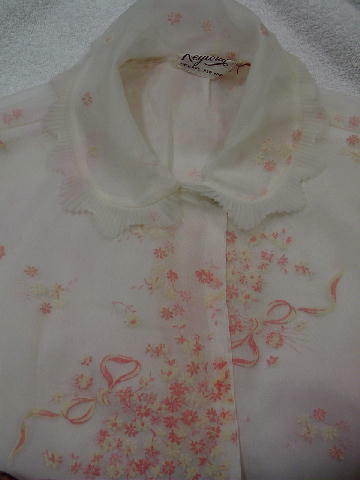 It has a pattern of soft elevated flowers and bows in cream and coral-peach. It has a collar with mini pleats in a scalloped edge pattern. It has a 2 snap top closure and elastic at the bottom of the sleeves. The hems are rolled and stitched - it's nice detailing. It was used as a jacket/coat in a magazine photo shoot with a Dolce & Gabbana black lace dress, Oscar de la Renta beaded high heeled boots, a vintage fox hat, and an antique lace and crystal encrusted flower patterned veil. Play up your feminine side. It's just perfect for those Saturday or Sunday mornings you (both) stay in bed. We suggest something very skimpy underneath. shoulder to end of sleeve 15 1/2"
shoulder to bottom of inner hem 44"